Leeds, UK, 29 November 2012 – Technology entrepreneur Martin Port has launched his most exciting venture to date, BigChange, which brings “mobile apps” into the mainstream for transport, fleet and field service operators. One of the most innovative products to appear on the scene in decades, BigChange Apps connects drivers and fleets seamlessly to the office using a rugged fixed or portable touchscreen computer. The innovative system promises to make a big change to the way companies manage their fleets, drivers and employees on the road. BigChange significantly reduces the cost of mobile computing, eliminating paperwork and delivering greater efficiencies during tough economic times. Martin Port was the UK founder of Masternaut and was behind the success of the company that became Europe’s largest vehicle tracking company. 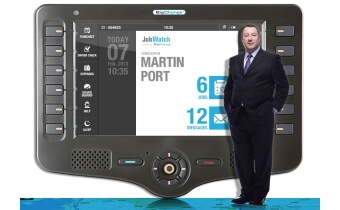 With his new venture, fleet operators will get access to JobWatch Office and JobWatch Mobile App supplied as an out of box solution that works on the latest BigChange Rugged Mobile Computer, which is available as fixed or portable with a 7-inch or 4-inch screen. The product incorporates everything from mobile communications to satellite navigation, all apps and vehicle tracking for £39.95 per month. This cloud-based service gives instant return on investment for customers through 4G telematics and revolutionises their customer service, enabling them to make a big change in the way they run their business, eliminating unnecessary mountains of paperwork, high telecommunications bills and the cost of buying and managing multiple mobile devices. says Martin Port, CEO of BigChange.